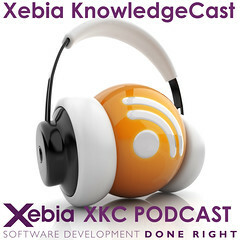 The Xebia KnowledgeCast is a bi-weekly podcast about software architecture, software development, lean/agile, continuous delivery, and big data. Also, we’ll have some fun with stickies! In this 5th episode, we share key insights of Madhur Kathuria, Xebia India’s Director of Agile Consulting and Transformation, as well as some impressions of our Knowledge Exchange and Scrum Day Europe 2014. And of course, Serge Beaumont will have Fun With Stickies! First, Madhur Kathuria shares his vision on Agile and we interview Guido Schoonheim at Scrum Day Europe 2014. In this episode’s Fun With Stickies Serge Beaumont talks about wide versus deep retrospectives. Then, we interview Martin Olesen and Patricia Kong at Scrum Day Europe 2014. Want to subscribe to the Xebia KnowledgeCast? Subscribe via iTunes, or use our direct rss feed. Your feedback is appreciated. Please leave your comments in the shownotes. Better yet, send in a voice message so we can put you ON the show! The sounds used for podcast imaging are all created by audionautix.com. The original feed for the Xebia KnowledgeCast was created by Serge Beaumont & Robert van Loghem. All interviews were recorded in double mono with a Marantz Pro PMD661 recorder using a handheld AKG D230 dynamic mic, a Rode NTG2 condenser mic on a boompole, or a KEL HM-1 condenser mic on a mic arm resulting in a 96.0 kHz, 24-bit WAV file. The “Fun With Stickies” section was recorded using the Auphonic recording app. Editing was done on a Macbook Pro using LogicPro with a light voice over filter. Post production was done using Auphonic resulting in the final MP3 file for upload to Libsyn and distribution through iTunes and Stitcher.